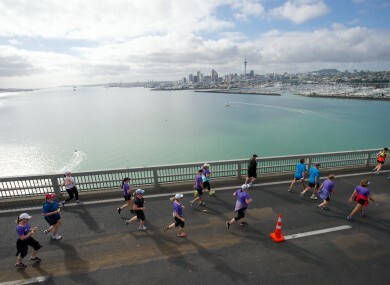 Runners cross the harbour bridge in the 2014 Auckland Marathon. SITTING ON THE side of the road, being held up by a paramedic, I knew I’d made a mess of my first, and probably only, marathon. Seven months of training, the monotonous pounding of the pavement, struggles with tendonitis in my Achilles, and the gruelling mental battles, only for my ego and irrepressible competitiveness to sabotage it all. Don’t do what I did. If you’re a novice, stick with what you know, run conservatively and don’t obsess over times — finishing one of these things is an achievement in itself. It was almost three years to the day: 3 November 2013, and on the other side of the world. I rose at 5am on that fateful Sunday morning full of optimism, the alarm clock proved an unnecessary precaution; the anticipation of the race had me wired. After making my way into the city centre, I arrived to find the streets still being swept clear of the previous night’s Halloween festivities. I jostled my way on to a ferry in the pitch black with hundreds of other runners to make the journey across the harbour to Auckland’s affluent North Shore. It took no more than 20 minutes to get to our destination, and the starting gun wouldn’t be firing for another hour. With so much time to kill I sat myself in the corner of the ferry terminal, where it was warmest, scoffed a banana and put the headphones in. Any distraction would do. The wait to get going was agonising, there were only so many times I could tell myself to ‘run at my own pace, go conservatively, and listen to my body’. If I did that, everything else would take care of itself. It’s a rare joy to see the sun rise, but on this particular morning its appearance brought such a sense of relief. The waiting and months of preparation were finally over, my body and mind were ready for this; the sacrifices had been made, the miles were in the legs. I just had to run one sensible race and I’d be enjoying a cold cider and a barbecue with my mates in a matter of hours. If only. It had all been going so well. My troublesome Achilles, which had caused me to taper my training sooner than initially planned, was causing me no pain. Conditions were perfect on a crisp spring morning; the sun would be doing no more than warming our backs by the time we crossed the finish line. My main problem was, for all I tried to avoid it, I couldn’t help but target a time. The goal was certainly achievable, my five 30km and two 35km training runs were testament to that. But I foolishly went beyond that pace in the first half of the marathon, hoping those extra minutes I had gained would stand to me as the lactic acid started to tighten its grip on my legs with 10-15km remaining. I had no business being in 260th position at the halfway point, about five or six minutes ahead of schedule, but the adrenaline was flowing and my body felt good. I was 2-0 up at half-time, I just had to consolidate my lead. I had navigated the hillier part of the course relatively comfortably, aided by the excitement of running across the scenic Auckland Harbour Bridge, a glorious sight usually reserved for motorists. It didn’t take long for everything to fall apart though. Just seven kilometres and a missed drinks station later (I was too busy looking straight ahead, trying to suppress pain), and my legs were wobbling uncontrollably. Scores of people began to pass me, something that my self-destructive ego struggled to comprehend. In a matter of a few hundred metres the horizon began to oscillate before my eyes. Light-headedness was taking over, delirium setting in. That’s when I dropped. For the first time in my life my body and mind combined to say, ‘no more’. As I came to, I saw, through blurry eyes, a paramedic’s fluorescent overalls approaching me on two wheels. Questions were repeated over and over, as we both struggled with comprehension. This wasn’t the standard accent barrier I had to often deal with. I could hear myself speak but they weren’t the words I had conjugated in my head. They weren’t words at all. After testing my blood sugar, the paramedic, an affable New Zealander in his early-30s, told me to call it a day. He was pretty concerned upon telling me my blood sugar was at a low 1.8mmol (millimoles of glucose per litre of blood), but that didn’t mean a jot to me. Besides, I wasn’t even looking at him. I was in a hypnotic daze, fuelled by envy, as I watched streams of sympathetic runners pass me by. In my head, all I could picture was the smirking face of a then employer, who I felt, perhaps unfairly, would take pleasure in my failure. He warned me this would happen, and I couldn’t face hearing ‘I told you so’. “I’m going to have to call you an ambulance,” the paramedic insisted. “Don’t do that. I’ll be OK. I can’t NOT finish this thing,” I pleaded, finally finding clarity in my speech, and staring at him to convey my sincerity. That bought me some time. After a five-minute argument, the paramedic placed his radio back in its holster after putting the ambulance on ice. There was only one place I was going of my free will, and that was further down this coastal road. The change of plan led to me washing sticky glucose energy gels down my trap with cola until my blood sugar returned to a safe level. The paramedic kept asking me how I was feeling but all I wanted to know was how far I had to go — I was still obsessing over my target time and felt, in my delusion, that I could eventually make up for this curbside sojourn. Impatient as ever, I kept encouraging him to repeatedly check my blood sugar so that I could get the go-ahead to get back on my feet, all while slurring questions to passing runners as I attempted to calculate the distance to the finish line. And then, after about 20-odd minutes on the side of the road, my blood had spiked to the magic number and I was helped on to my feet, only to fall down again almost immediately. The stand-stumble-and-repeat process continued, comically to onlookers I imagine, for another 10 minutes until I could complete a slow, meandering, 500m walk unassisted. The paramedic had done all he could at this point. I was now feeling sick from all the sugar and no doubt he had digested more than enough of my stubbornness for a lifetime. It was then, about 40 minutes after my first stumble, and at the marker for 29km, that I was back on my own and facing a lonely 13km where I would find myself plummet into a dogged mental and physical battle I will never forget. I have suffered from cramps occasionally over the years — hamstrings, quads and calf muscles are the usual culprits. But on this occasion, particularly after my dehydrated body had gone cold so rapidly from sitting on the side of the road, I was struggling with full-body convulsions. Each one felt like a mini seizure. It wasn’t pretty. I was no longer surrounded by athletes, I had drifted back into the marathon casualty ward. Limps were more common than not as fellow runners battled calf blow-outs, knee pain and who knows what else. It was only then that I resigned myself to the fact that I would not be achieving the ambitious time that I had so yearned for, the goal that got me through those solo 30km runs before work on a Sunday morning, the lung-busting weekly slog up Auckland’s beautiful, but wickedly steep, One Tree Hill, and the social sacrifices that had turned me into a borderline recluse. The training had been arduous at best, more taxing on the mind than anything else. Every kilometre in preparation was done on my own, rattling thoughts around in my head until they went stale. But the goal was simple at that point — finish this thing. It was a rescue mission, a chance to salvage some pride. My body was doing all it could to abort the challenge but my mind held firm, just. And it wasn’t long before I had built up to a steady jog again. An excruciating, cramp-interrupted jog, but a jog all the same. There was a great sense of solidarity among us wounded runners. Arms were curled around shoulders once grimaces of near-defeat were spotted. My training may have got plenty of miles in my legs but none of that had prepared me for the pain, the burning and the mental anguish I would deal with over the next hour or so. I dipped into reserves I didn’t realise I had, talking myself through it when my body screamed at me to quit. Slowly but surely though, the markers were being ticked off. I set myself small goals. Make it to 30km, 33km, then 35km, next was 36km (6/7ths of the race completed). Reaching 37km saw me cross a huge mental barrier too — just over 5km to go, a distance that wouldn’t cover even the briefest of my three weekly runs. Passing the 40km mark, I felt a smile return to my face for the first time in quite a few hours. There may have even been a chuckle as I considered the ordeal. I’d be crossing this finish line after all. I knew then that I could hobble into work two days later, with some measure of pride. The crowds really lifted me for the last 2000m, so much so that I ran the final 400m at half-pace, only to stumble over the line with another cramp. It took almost 70 minutes longer than I had hoped, but I was over the line nonetheless. I soon found a pair of familiar faces who had come into town to cheer me home, although they were clearly puzzled by my late arrival, especially after checking my halfway split time with officials. I barely had the energy to explain. Instead, one of them insisted on detailing his vicious hangover from the previous night’s Halloween party, and explained what a relief it was to see so many free energy drinks knocking about. If I had any energy left, I would have lost it. A broken man at this point, I was helped into a taxi and taken home. I arrived back to expectant faces who knew straight away something had gone awry. Celebrations were suspended indefinitely as I crawled back into bed, barely seven hours after leaving it, still in my sweaty gear, runners included, but with my medal around my neck. I was woken two hours later as a few friends had called around to offer their awkward congratulations. I lifted myself out of the nest, purely out of politeness, had a couple of mouthfuls of my celebratory Irish cider, a treat bought weeks in advance, and returned to bed less than an hour later, after a shower on this occasion, thankfully. The running gear went in the laundry and the runners were tossed into the back of the wardrobe, much like a Leaving Cert student’s notes at the end of the final exam. I wanted to wash my hands of the whole experience. My body would hurt for a few days but my pride took one hell of a beating. While many people ‘catch the bug’ after running their first marathon, I did the opposite. I still run every week but it’s always short and sharp, nothing over 10km has been accomplished since November 2013. Only now, three years later, am I considering going beyond that mark again. If you’re a novice preparing to run in Dublin tomorrow, don’t do what I did. I knew about the pitfalls and still fell into the trap. Run your first marathon sensibly, that way you might actually enjoy it. If you don’t, you might have a story to tell but trust me, it’s not worth the pain. Email “Paramedics, full-body cramps and regrets: Don't make a mess of your first marathon like I did”. Feedback on “Paramedics, full-body cramps and regrets: Don't make a mess of your first marathon like I did”.